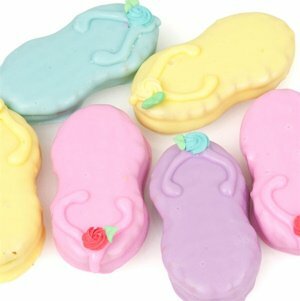 Classic Nutter Butter peanut butter cookies are hand-dipped in Pastel Guittard confections and then hand-decorated to look like flip-flop sandals. They are embellished with royal icing flowers as well. What a great addition to beach weddings or seaside events! Choose the specific cookie color (pink, blue, green, lavender, peach or yellow) or choose to get an assortment of all colors. Each cookie arrives individually wrapped in a heat-sealed cellophane bag. Note - This item includes a personalization, color, size or design option: Cookie Color (View Options) (Free of charge). You may specify this information during our checkout process.